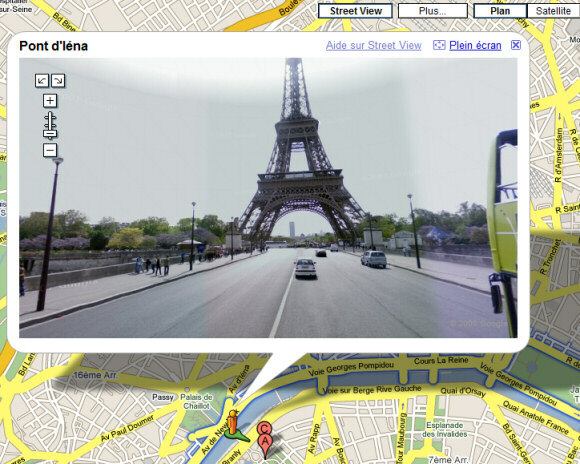 As a special present for the upcoming Tour de France, Google added Street View imagery for Tour de France's routes. The coverage is really limited, but Google will extend it in the next months, when Street View will be available in many European countries (UK, France, Germany, Spain, Italy and others). Wikipedia has some details about this year's edition of the largest cycling race in the world. "The event will take place from July 5 to July 27, 2008. Starting in the French city of Brest, France, the tour will enter Italy on the 15th stage and return to France during the 16th, heading for Paris, its regular final destination, which will be reached in the 21st stage." Street View in the UK? Hope so! Cool! It's also available in the Google Earth Street View layer. Some of the imagery looks quite good (better resolution). The imagery is great as compared to the US data. I look forward to seeing some interesting additions to the Google Street View Gallery! footage done by immersive is very blurry! footage done by google itself is very crisp! SFC is google, NYC is immersive, almost unusable!!! the french data is done by google itself, thus crisp and sharp. a friend saw a google opel astra gathering footage for street view in berlin 2 weeks ago, that means that within 3 months that footage will be online! i think it's safe to say that in 3 months most EU metro areas will be online in GE and GM street view layers!!! Much cheaper than an airline ticket!